Remove chocks and roll. Is moving your aircraft difficult and downright troublesome? Redline Aviation tow bars provide ready relief. They attach quickly, work simply and require less effort. Redline Aviation print ad featuring Ready Redline. 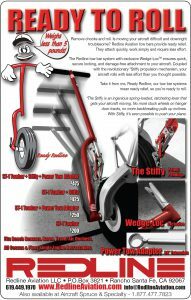 Redline aviation manufactures aircraft Tow Bar Systems with “The Stiffy,” Wedge-Loc and Power Tow Adapter options.